Don’t you just love it when a man in uniform appears on state TV to tell you the leader of a country has stepped down while briefing the rest of the world that this is NOT a military coup. That’s what we were told when Egypt’s only democratically elected president, Muhammad Morsi, was removed from power and the Egyptian people ended up with former general Abdel Fattah Sisi as the new leader in an election which few voted. 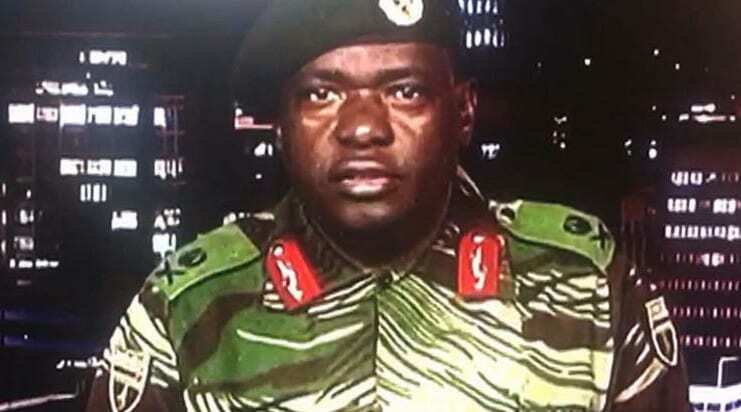 Now in Zimbabwe we are told President Robert Mugabe is no longer in control and the news has been relayed on state TV by a man in a uniform who insists this is not a military coup! While it is clear 93-year-old Mugabe is no longer in power, it appears there’s been some sort of internal party takeover ‘to refresh the political system, with the army’s support. The trouble is once men in uniform take control they are usually reluctant to relinquish power. While, admittedly, it couldn’t happen to a nicer person the world’s oldest head of state has yet to make any formal announcement. Since Zimbabwe’s strongman made sure his domestic political opposition remained weak and disorganised, it appears the power struggle has come from within the ranks of his own party. The international community gave up a long time ago of using external pressure to bring down Mugabe. So it is perhaps, with some irony, that his very own ruling Zanu-PF party has done the job. I think Zanu-PF would have put up with his increasingly erratic behaviour had it not become clear that Mugabe wants his wife Grace to become his successor. I’m all for positive discrimination for women in politics but Mugabe was not promoting his wife Grace to send out some sort of gender equality message across Africa. If anything it was a message of nepotism, dynasty and almost monarchal ambitions … the last things African nations need right now. Last week Mugabe fired Vice President Emmerson Mnangagwa, who is part of an influential faction within Zanu-PF of veterans of the guerrilla war against white minority rule in the 1970’s. However it is believed that Constantino Chiwenga, commander of the armed forces, is the driving force behind the coup. Just a few days ago he claimed the party’s youth faction, which is loyal to Grace, was purging veterans of the country’s liberation struggle. What happens now is anyone’s guess. The Americans are remaining unusually non committal and so are the Chinese which is also unusual since General Chiwenga popped by Beijing only last week for a meeting with Zimbabwe’s close allies. Since we didn’t read anything pertaining to Zimbabwe in US President Donald Trump’s tweets we can assume the general’s meeting was out of earshot of Trump!